The CW's Supernatural returned from its holiday hiatus last weekend with an episode that served as a backdoor pilot for a potential new spin-off series entitled Wayward Sisters. With that episode now out of the way, the episode many fans are looking forward to the most is the animated Scooby-Doo crossover episode, and now we have the first poster, of sorts, which reveals the episode will be entitled ScoobyNatural. The image was unveiled by executive producer Jim Michaels on Twitter, which is likely the customized cover of the episode's script, due to the three-hole punch on the left-margin, with the January 22, 2018 date on the poster/cover likely the date of the script table read. The poster also reveals a number of interesting details, including that longtime Supernatural executive producer Robert Singer is directing this episode, and serving as an executive producer with Andrew Dabb, Phil Sgriccia and Jim Michaels. It isn't revealed who actually wrote this episode, but it does mention that this is "Eps. 1316," or the 16th episode this season. An official premiere date for this Scooby-Doo crossover has not been set, but with the 11th episode of Season 13 airing tomorrow, this crossover could air on Thursday, March 1, if the episodes between then and now run consecutively with no breaks. 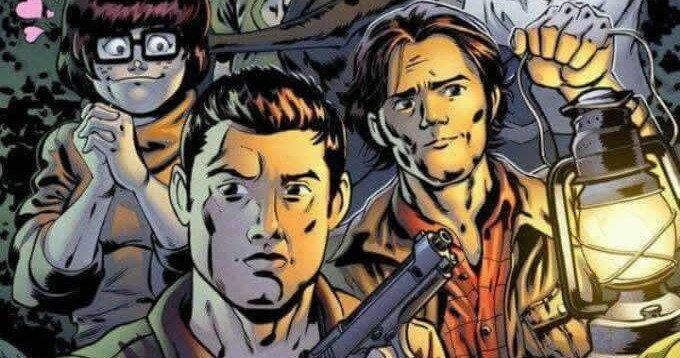 The crossover was first announced at The CW's upfront presentation back in May, when series stars Jensen Ackles and Jared Padalecki took to the stage to debut a photo of animated versions of their characters, Dean and Sam Winchester, alongside the iconic Scooby-Doo. No story details were given, only that this "colorful" episode will take place in the, "fully animated world of Scooby-Doo." There has been no indication as to whether or not other Scooby-Doo characters like Fred, Velma, Daphne and Shaggy will be present, but if this episode is in fact debuting this coming March, we'll hopefully get our first look at some footage or new photos soon. The Supernatural gang are no strangers to off-the-wall episodes. The show paid homage to the Winchester boys' late on-screen father, John Winchester, played by Jeffrey Dean Morgan, by showing the infamous Negan bat on Supernatural in a subtle Walking Dead crossover, after Jeffrey Dean Morgan landed the Negan role on The Walking Dead. There have been other oddities like an episode where the Winchesters get transported to a world where they're actually "Jared" and "Jensen," the stars of a show called Supernatural, while parodying a number of different shows and even pulling off a musical for the 200th episode. We also learned back in 2016 that there was almost a Supernatural and Smallville crossover that was being developed, but that never came to fruition. The episode would have featured the Winchesters learning that every actor who has played Superman has been cursed and will die, as they learn Smallville star Tom Welling was next on the list as they try to save him. As for this Supernatural and Scooby-Doo crossover, hopefully we'll find out more official details soon, but until then, take a look at this poster/script cover below, courtesy of Jim Michaels Twitter.